Special thanks to NetGalley and Algonquin Books for providing me with a free copy of An American Marriage for review. The following opinions are my own. An American Marriage will be published on February 6th. A couple of months ago, I saw An American Marriage featured in an article about the must-read books of 2018. As soon as I read the summary, I went straight to NetGalley to see if it was a title available for request. I was in luck–it was–and I now know that the article I read was spot-on. 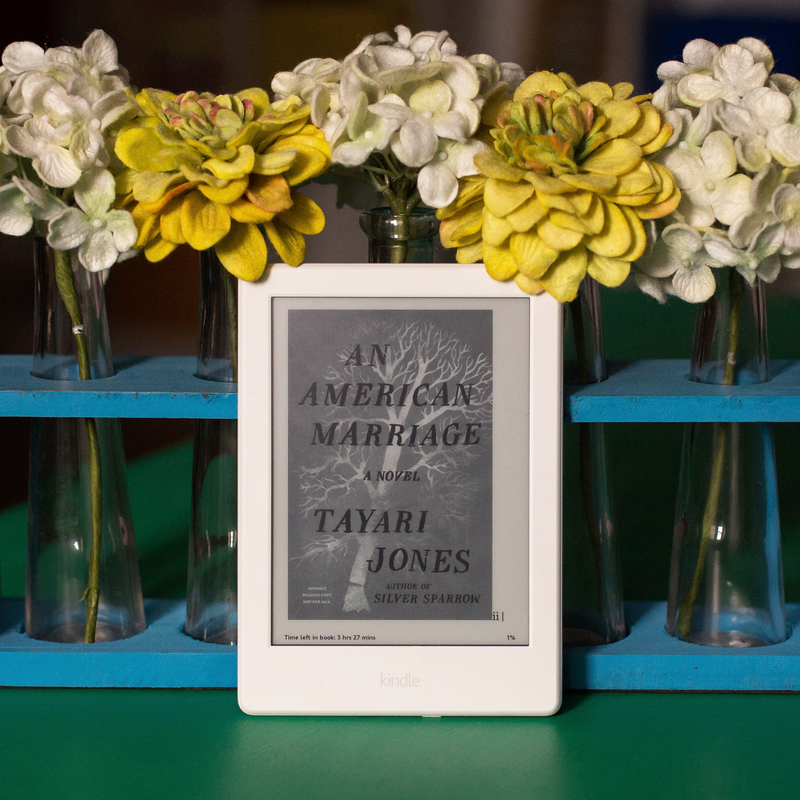 An American Marriage by Tayari Jones is one of THE books of 2018. An American Marriage begins by introducing readers to newlyweds Roy and Celestial, who come from totally different backgrounds. While Celestial was born into a family that had built itself up to a place of success and respectability in the suburbs of Atlanta, Roy’s story is much more humble. The two are married for a short eighteen months when Roy is arrested for a crime he did not commit while he and Celestial are in Louisiana visiting Roy’s parents. He is sentenced to twelve years in prison, and his and Celestial’s lives are torn apart and their marriage left hanging in the balance. An American Marriage is my first experience with reading Tayari Jones’s writing, and it won’t be my last. The narrative of the book is varied. During the time prior to Roy’s imprisonment and the time after his release, the book is broken into sections for first-person tellings by Roy, Celestial, and Andre, who is Roy’s friend from college, Celestial’s lifelong friend, and the man who first introduced the two. During Roy’s time in prison, the story is told through letters between him and Celestial. Jones’s decision to structure An American Marriage this way was an excellent one for several reasons. The first, and perhaps the most compelling, is the way that readers are able to understand each character’s point of view in a meaningful way throughout the book. This understanding left me torn, from beginning to end. In the beginning, the love and respect Roy and Celestial share is evident through their thoughts about their relationship and their feelings for one another. Once Roy is released from prison and the effects of his and Celestial’s time apart become apparent, I found this method to be even more powerful. With each character’s section, I found myself struggling with my own opinion of their situation and what I thought the outcome should be. As much as I connected and empathized with the characters, however, I also felt the natural detachment from their thoughts that their experiences might naturally create. For example, Roy’s experiences while in prison are only told through his letters to Celestial, and after his release, he doesn’t allow himself to think about some of the things that occurred while he was inside except in bits and pieces, during brief moments when the thoughts slip in unnoticed. Celestial’s thoughts reflect her reserved personality, and their change from prior to Roy’s imprisonment to after show how her identity as a strong, independent woman shifts as a result of Roy’s arrest. As perhaps the most genuine and unfiltered of them all, Andre’s thoughts reveal that his behavior is authentic to his feelings, and his inability to accept responsibility for his own role in Roy and Celestial’s marital problems is a result of his naive belief in the power of love. The sections of the book that are told through letters between Roy and Celestial also make a powerful statement. As the letters progress, readers begin to notice the growing distance between the two of them, and the letters demonstrate the struggle they experience as they try to connect emotionally without being able to be together physically. The issues they experience that tend to be typical for many newlyweds, such as issues with in-laws and differing ambitions, are exacerbated by Roy’s imprisonment, especially once readers discover details about a difficult choice they had to make soon after Roy’s sentencing that had a lasting effect on their relationship. By not allowing readers to know Roy’s and Celestial’s thoughts during this time and limiting them to the letters they write, Tayari Jones makes a powerful statement about the growing rift between them. What makes this book even more powerful is that An American Marriage is about so much more than Roy and Celestial’s marriage. Jones has also created a powerful commentary on the issues facing young black men in America and the ways the American judicial system is stacked against them. Roy was innocent and lost everything as a result. Jones not only showed the effects of his imprisonment on his material possessions and relationships, but she also did an excellent job showing the effects that prison had on his mental state and personality, and the state of Louisiana did nothing to atone for his unfair conviction or the destruction of the life he knew as a result. Roy Hamilton is representative of a much larger population of Americans who are arrested and convicted unjustly, simply because of the color of their skin. An American Marriage by Tayari Jones is one of the most honest novels I have read. The characters are deeply flawed, and they make their fair share of mistakes. Sometimes they acknowledge those mistakes, and sometimes they do not, and they make readers wonder what they would do in their shoes. This is an excellent book with layers upon layers of profound commentary, and it would be well worth anyone’s time to read it. Posted in FictionTagged Algonquin Books, An American Marriage, book review, Fiction, fiction review, literary fiction, Tayari JonesBookmark the permalink.